Experience Dauphin Island the way it’s been experienced for a century. 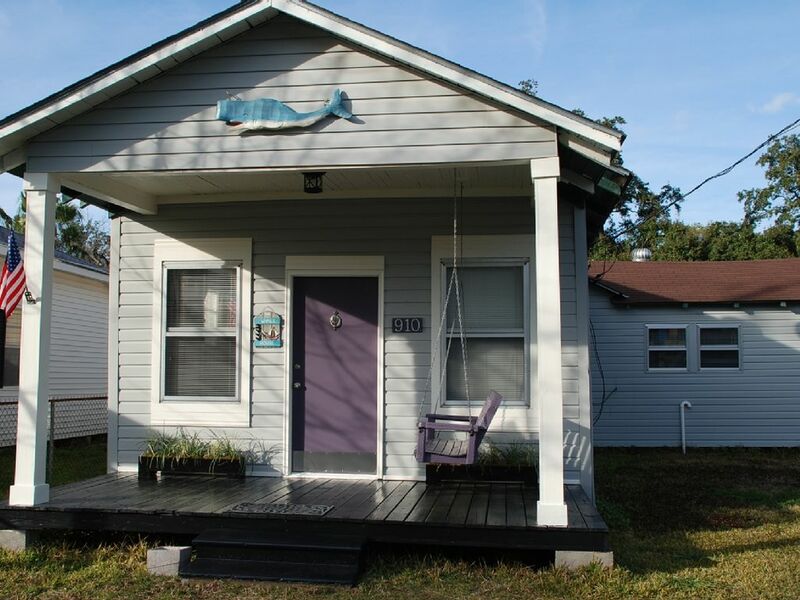 This updated 2 bedroom, 1 bath shotgun built in 1916 is in the center of Dauphin Island Village, less than a block from biking trails and a short walk to the Indian Mound, Goat Tree and Green Parks. Sleeps 6: king, double & sofa pull out. Comes with reserved boat slip on Indian Bay. A Central Location: The Whale House is really in the center of 'town'. I use quotation marks because there are only about 1,100 full-time residents and the entire Island is only 14 miles long. You're able to walk to most activities and bicycle riding gets you to the places that walking doesn't. Three of the island's 4 restaurants are within walking distance...not including the Bakery, behind the cottage. The beaches are accessible via bicycle, short car ride, or the town's public transportation (two minivans). Things We Love About the Island: There is a large bird sanctuary that provides excellent walking paths - you'll see beach, forest and swamp on the walk. We love to go there. There is also a small forested bird watching area that we like to walk through as well (an old Indian mound). The Estuarium is great. They often have fun classes as well as a great tour through their fish/sea life exhibits. Reservation includes a boat slip on Indian Bay. We enjoyed almost all of the things about the WH except for the Dish TV. I found it just about impossible to to connect to most of the offerings shown on the screen. The directions to make sure the SAT button in the left side of the remote was punched were mystifying. There was no SAT button anywhere on the remote. I could only get FOX News (which my wife hates), CBS and TBS. I was able to watch Michigan State defeat Duke in the NCAA basketball tournament so all was not lost. Better TV Dish instructions are suggested for future users unfamiliar with using the Dish network. The WH is nicely located near everything we wanted to do or go. Easy biking to the Shell Mound and Audubon Sanctuaries, Lighthouse Bakery (walkable), Skinners, Community Center and other locations near downtown. Well kept rental, clean and easy to use. Comfortable spot for a relaxed vacation. The house was comfortable & cozy. Quiet, clean and comfortable. Nice kitchen. We enjoyed the whale house. It was clean and homey. A quiet neighborhood. We enjoyed sitting out on the porch swing. Thank you for allowing us to stay a few day. Thank you for staying with us and your nice review. We had a lovely time in this little cottage. Thank you!! That's great! Thank you for taking the time to post. Hope to see you back again. Excellent stay! House had everything I needed and more. Dauphin Island is a barrier island located three miles south of the mouth of Mobile Bay in the Gulf of Mexico. Entry to the island is made by crossing a three mile long, high rise bridge. An automobile ferry from the eastern shore provides another entry point from Gulf Shores, AL. The island is approximately 14 miles long and 1 ¾ miles wide at the widest point. It is estimated that 1300 permanent residents call Dauphin Island home. The number of residents soars during vacation and holiday times. The entire Island has been designated as a bird sanctuary. Many attractions are located on the east end of the island including a Civil War fort, the Dauphin Island Sea Lab and Estuarium, Audubon Bird Sanctuary and numerous boat launch sites. The Island's beautiful beaches of sugar white sand, public golf course and parks are added attractions located on the west end of the island. Together they make Dauphin Island a wonderful laid-back resort destination.